You must be a member of the Singapore Dessert Lovers Group to attend this activity. Would you like to join this group? 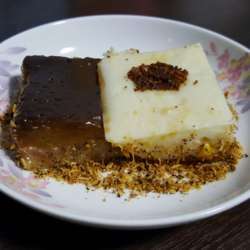 As our first activity for this year, I would like to introduce you to some desserts that I grew up with, Filipino desserts. Most Filipino desserts are made up of glutinous rice, brown sugar and coconut milk such as 'biko' (a sweet rice cake topped with coconut milk curd), 'suman' (a steamed rice cake wrapped in banana leaves), and 'maja blanca' (a coconut pudding usually with corn kernels) to name a few. You can also try 'turon' which is made up of thinly sliced banana and a slice of jackfruit, dusted with brown sugar and wrapped in a spring roll then fried or 'Brazo de Mercedes' which is a rolled meringue cake filled with lemon flavoured custard. And if you prefer a cold dessert, you can try 'halo-halo' (a concoction of crushed ice, evaporated milk and various ingredients such as sweetened beans and banana slices, boiled sweet potato, seaweed gelatin, etc and topped with a scoop of ice cream and a slice of leche flan, or 'banana con yelo' (made up of crushed ice, evaporated milk and thin slices of sweetened and boiled bananas). If you have further questions about our activity, please feel free to drop me a message. I'm looking forward to see you all!